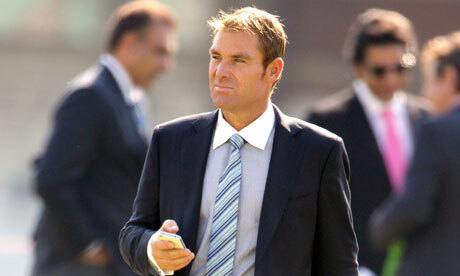 What’s up with Shane Warne? Leaving aside the fact that he appears to have morphed from the chubby, frosted-tip rogue that he was for several decades into Dale Winton’s blond brother, all with the help of nothing other than the Estée Lauder moisturisers his girlfriend Elizabeth Hurley happens to shill for, it’s the man himself that concerns me. And, Shane, take my hand. Look me in the eye – no, not back at Liz, not at the tube of mascara on the windowsill, look right into my eyes, Shane. I’m worried about you. It perhaps won’t come as a complete surprise to learn that I am not a cricket expert. Until about, oh, two months ago I though Wisden was “Wisdom”, which I did think was a somewhat arrogant name for a cricket magazine (or whatever the hell it is). But when I saw photos of Shane on his way to play golf looking like a model from a 50s catalogue, and when I saw that he’d been described by the Daily Mail as “a smartly dressed metrosexual” – a phrase as ominous from the Daily Mail as “brutally honest” or “plain speaking” – I knew my help was needed. This is not a plaint of the quasi-misogynistic and homophobic ones that have appeared in other, inferior rags, which can be summed up as “Liz ‘That dress’ Hurley turned Shane into a big queen”. Please. Like any “queen” would allow himself to be dressed – and by Liz Hurley, of all boring people. I have been informed by the Guardian’s lawyers that I am not allowed to talk about the eyeliner and Botox that Shane clearly is not using. I am, however, allowed to wonder where a man even buys a tan sweater vest such as the one Shane wore for his little golf game. Why has Australia not staged an intervention? And after the humiliations this country have inflicted on Rupert Murdoch and Warne, why has Australia not declared war on Britain? Well, in the case of Warne, I fear I know the answer. Last week, Shane – with a Forrest Gumpian lack of self-awareness – tweeted the location of his followers and proudly announced the results: UK 40.6%, India 26.8% and Australia 12.9%. That’s right: Australia has already disowned him, washed its collective hands of the man who won quite a lot of cricket matches for it (look, go to the sports section if you want specifics. Come to me for the hand-wringing OK?). That’s right: the country that claims as its own John Farnham, Paul Hogan and Alf Stewart has decreed that Shane is no longer man enough for it. It’s just too sad. Although I will admit that the fact he preceded this terrible announcement about the treachery of his homeland with a tweet to Ping Pong saying how much he is “looking forward to seeing my fluffy sweet parrot soon! Yes – will have gifts …” makes it difficult for me to condemn Australia entirely. Something happens to a certain kind of man when he loses his identity. And so, from “stylish metrosexual” Warne we move seamlessly to Piers Morgan. It may be difficult to believe but Morgan wasn’t always quite so objectionable. But something went very wrong when he lost his job as editor of the Mirror. As a simple comparison between just the titles of Morgan’s first memoir, the very good The Insider, and the very poor second one, Don’t You Know Who I Am, prove, it seems like Morgan decided the only way he could find self-validation was through cheap fame. Now, the man who once banned celebrities from his newspaper can be found on CNN asking Kim Kardashian how he can get more Twitter followers. Similarly, the former cricket champion of Australia (or whatever he was) spends his days on Twitter since retiring from his sporting job, boasting about his newfound love of healthy eating, telling people to play online poker with him and sending messages of love to Elizabeth Hurley’s parrot. Never mind how a man should behave, this is no way for a human to behave. Oh, Shane – take my hand. Let me liberate you. The bottle of hair peroxide is already waiting in my bathroom, just waiting to re-frost your tips.